For the breed of sheep, see Navajo-Churro sheep. A churro (Spanish pronunciation: [ˈtʃuro], Portuguese pronunciation: [ˈʃuʁu]) is a fried-dough pastry—predominantly choux—based snack. Churros are popular in Spain, Portugal, France, the Philippines, Ibero-America and the Southwestern United States. 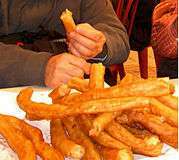 In Spain, churros can either be thin (and sometimes knotted) or long and thick. They are normally eaten for breakfast dipped in champurrado, hot chocolate, dulce de leche or café con leche. Another theory is that the churro was made by Spanish shepherds, to substitute for fresh bakery goods. Churro paste was easy to make and fry in an open fire in the mountains, where shepherds spend most of their time. Churros are fried until they become crunchy, and may be sprinkled with sugar. The surface of a churro is ridged due to having been piped from a churrera, a syringe-like tool with a star-shaped nozzle. Churros are generally prisms in shape, and may be straight, curled or spirally twisted. 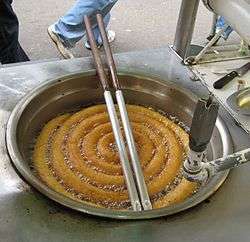 Like pretzels, churros are sold by street vendors, who may fry them freshly on the street stand and sell them hot. In Spain and much of Latin America, churros are available in cafes for breakfast, although they may be eaten throughout the day as a snack. Specialized churrerías can be found in the form of a shop or a trailer during the holiday period. 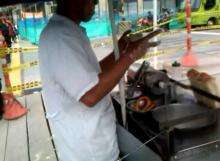 In addition, countries like Peru, Venezuela and Colombia have churrerías throughout their streets. In Portugal, they are commonly eaten at carnivals, fairs and other celebrations, where they are made freshly at street stands. The dough is a mixture of flour, water and salt. Some versions are made of potato dough. In Seville (Andalusia), the name "calientes" or "calentitos de rueda" is sometimes used instead of the word churro. These tend to refer to the thicker variant, called porra in northern Spain, the Basque Country and other regions. Calientes are usually fried in the shape of a continuous spiral and cut into portions afterwards. The center of the spiral is thicker and softer, and for many a delicacy in itself. The standard "churro" is also sold under the name "calentitos de papas", the name referring to the softer mashed potato–like texture. Filled, straight churros are found in Cuba (with fruit, such as guava), Brazil (with chocolate, doce de leite, among others), and in Argentina, Bolivia, Peru, Chile and Mexico (usually filled with dulce de leche or cajeta but also with chocolate and vanilla). In Colombia and Venezuela, churros are glazed with arequipe and sweetened condensed milk. In Spain, a considerably wider diameter is used to accommodate the filling. In Uruguay, churros can also come in a savoury version, filled with melted cheese. Churros in American theme parks and street fairs are most often rolled in cinnamon sugar or other flavored sugars. ↑ "Churros: a secret history". Retrieved 2011-10-16. ↑ "Churro Encyclopedia". Retrieved 2011-12-27. ↑ "Churros: The Hidden History". The Huffington Post. 2011-08-18. Retrieved 2011-10-16. ↑ Díaz, Ana (2012-10-31). "Calentitos versus churros". ABC. Retrieved 19 June 2014. ↑ "Una de calentitos". Toda una amalgama. 18 October 2013. ↑ "La muralla duda: rueda o papa". Diario de Sevilla. 18 May 2009. Retrieved 19 June 2014.